How exactly do I freeze a banana? Freezing bananas is easy! You just have to make sure that you remove the peel before you put the banana into the freezer. I usually take a few bananas, peel them, and then split them in half. Then, I put the halves into ziplock bags which I then put into the freezer. Frozen bananas usually last a few weeks in the freezer, but they do eventually go brown. Why are bananas good for me? There are a lot of reasons! 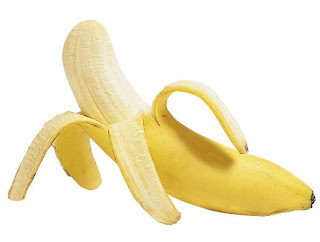 First of all, bananas are a great energy source, and are believed to help regulate a person's mood, thereby helping with anxiety, stress, etc. They are also a good natural source of fiber, protein, and potassium which is believed to help cellular growth in addition to helping to control blood pressure. Also full of antioxidants like beta-carotene, bananas help boost our immune systems, protecting our bodies from infections! Any ideas on what to do with the frozen bananas? Yes, there are tons of possibilities! I've blogged before about using them to make low calorie smoothies, but you can also eat them right out of the bag, or dip them in a tablespoon or so of chocolate syrup (will blog about my favorite low calorie one soon!) and roll them in some crushed soy nuts, eat them with your favorite low calorie frozen yogurt or low calorie ice cream for a yummy low calorie dessert, or add them to some low calorie cereal, fruit salad, vans waffles, or low calorie yogurt (like fage yogurt) for a yummy low cal snack. Remind me how many calories are in bananas? It depends since each banana is a different size. Small bananas are usually around 90 calories with 2g of fiber, and large bananas can be as much as 120 calories and 3.5g of fiber or more. The best way to know how many calories your banana has in it is to weigh it and use a site like Calorie King to look up the exact calories. Cool site! I like to add frozen bananas in my oarmeal. It makes it creamier than with unfrozen. Also, I like to cute them ahead of time and put a little peanut butter on them. Thank you so much for this site, (I'm bookmarking ya) and I'm excited to try this out! I love bananas. But I never thought about sticking them in the freezer I always thought they would darken right away. I really can not wait to try this.